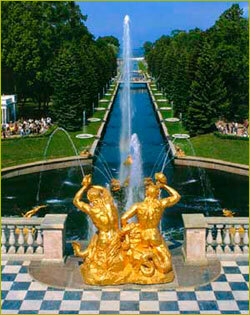 "CELEBRATION OF THE FOUNTAINS AT PETERHOF"
The festival on the Grand Cascade of Peterhof will include a grand theatrical perfomance, the illumination of the Lower Park and numereous pyrotechnical, sound and light effects. Events archive for 19 September' 2009. Events archive for September' 2009. Events archive for 2009 year.